Presented by NoMAA in partnership with Broadway Housing Communities and the Sugar Hill Children’s Museum of Art and Storytelling, “Uptown Arts Review” is an exhibition showcasing the work of 29 local artists working in a variety of media. Curated by Andrea Arroyo. Participating artists: Sarah E. Alcántara, Brandy Bajalia, Yael Ben-Zion, Emily Bradley, Susan Bresler, Joana P. Cardozo, Diane Drescher, Aliya Frazier, Felipe Galindo, Katte Geneta, Xóchitl Cristina Gil-Higuchi, Michelle Orsi Gordon, Wilhelmina Grant, Cynthia Hartling, Shinsuke Higuchi, Josefa Jaime, Amaryllis León, Lilia Levin, Iván Martínez, Michelle Melo, Angela Miskis, Rosa Naparstek, Ydania Ogando, Diana Schmertz, Tony Serio, Elizabeth Starcevic, Yasuyo Tanaka, Lisa Turngren and Aislinn Weidele. Free and open to the public; everyone is welcome! 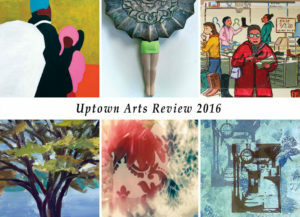 Join the artists of “Uptown Arts Review” as they share their processes and visions, followed by the workshop “Best Practices in Marketing and Promotion,” where curator Andrea Arroyo will share the best art marketing tools, including online and hard-copy portfolios and other promotional materials. This workshop is appropriate for emerging and mid-career artists of all disciplines.